Global Competence is the disposition and knowledge to understand and act on issues of global significance (CCSSO & Asia Society). Those issues are identified in the Sustainable Development Goals adopted by countries to end poverty, protect the planet, and ensure prosperity for all (United Nations). Globally competent individuals are life-long learners who understand these issues and have an appreciation for cultural differences, an ability to understand and consider multiple perspectives, use critical and comparative thinking skills as well as problem-solving abilities, and are comfortable with ambiguity and change (World Savvy). How can we develop Global Competence? CGEP identifies the following specific indicators, or competencies, within these four domains for educators, students, parents/guardians, and community partners to use for themselves and for instructional purposes in developing global competence. Combined with the Sustainable Development Goals, these global competence indicators guide the work of CGEP in supporting global education in PK-12 programs in California. The rationale and core philosophy described below provide the underpinnings for that work. 1. Identity: An examination of self and one’s identities is critical in the ability to develop one’s own global competence. For students, this examination requires research and reflection about multiple facets of identity – racial, ethnic, gender, religious, socioeconomic, age, family, and other cultural factors. For educators, this examination helps to inform how global competence is framed and fostered in their students. In other words, educators must develop global competence themselves before and while supporting student development of global competence. 2. Diversity: We value multicultural and multilingual societies and celebrate the benefits of living in a diverse community and world. 3. Equity: Global education is for all students. Every student has important and valuable contributions to make in a global community as well as in a global studies program. Each student deserves the opportunities and the benefits of a global education. In our increasingly interconnected world, a global education is essential for people to navigate the world in which they live and have equal access to opportunities. 4. Perspectives: Global issues are complex, interconnected, interdependent, and are informed and influenced by historical, geographic, political, cultural, and economic forces. 5. Foundations: Understanding and appreciation of world history, geography, cultures, and belief systems provide a basis to developing global competence. 6. Collaboration: California educators have an opportunity to empower their students to address local and global problems identified in the United Nations Sustainable Development Goals. 8. Access: Fostering global competencies in students occurs across grades PK-12 and requires developmentally appropriate learning experiences. 9. Engagement: Globally competent citizens are inspired to advocate for themselves, their communities, the common good, and a better world. 10. Inclusion: Global education can occur in many courses and programs, and is not isolated to social studies, world languages, or special programs (e.g., International Baccalaureate). Travel abroad and language learning are important aspects of global education, but are not the goals or markers of global competence. 11. Empowerment: Global education is intended to prepare students to become active citizens in an ever-changing world. It is not designed for students to feel guilt, sadness, sorrow, or helplessness about the conditions of others. While students should learn about their own identities and the cultures of others, global education is not simply a parade of food, festivals, and flags. 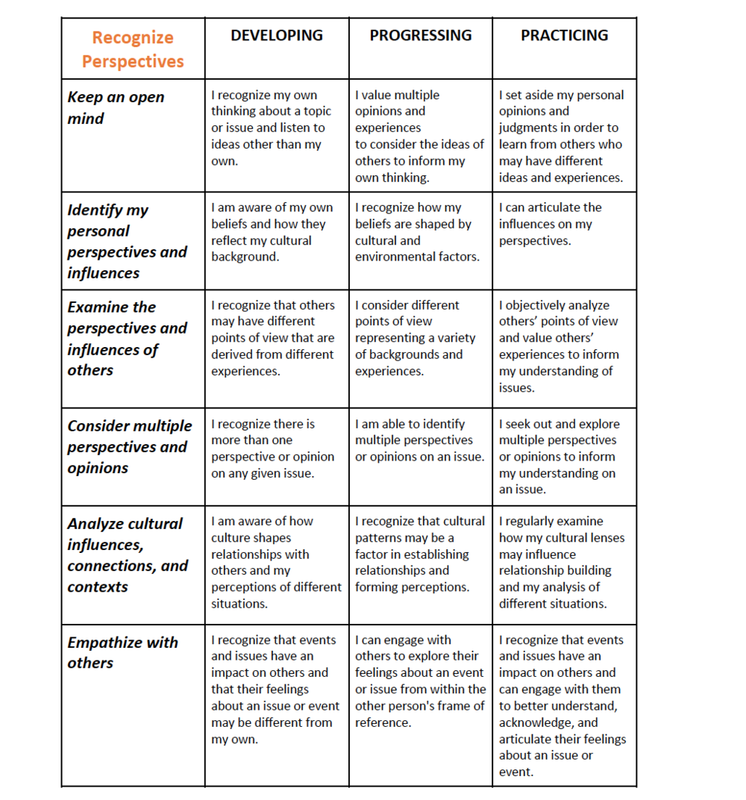 In developing global competence, students consider cultures, values, and contexts while suspending assumptions and judgements. 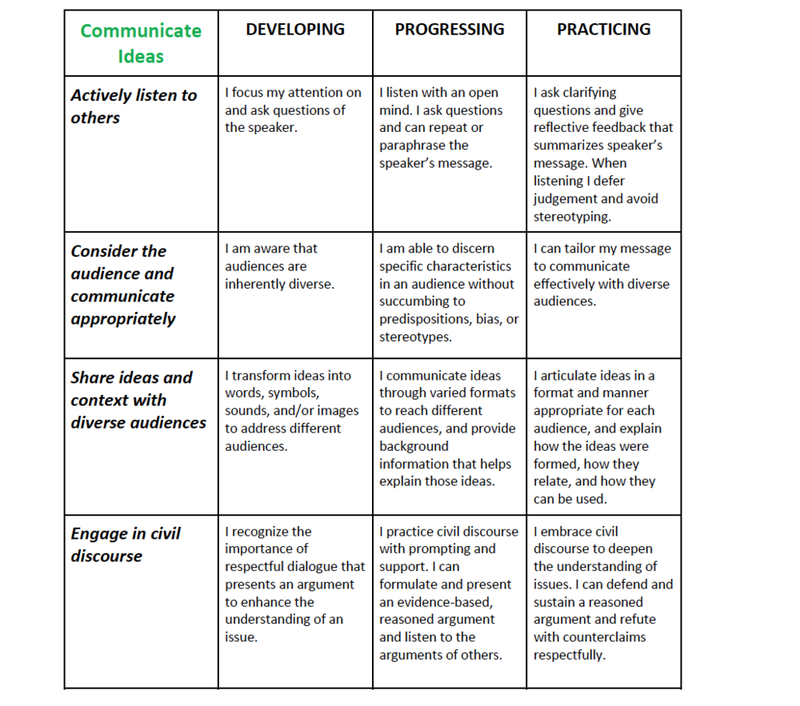 They ask questions and conduct research to better understand situations before communicating ideas and taking actions that are solution-oriented. Students realize that fundraising and giving items to others may provide temporary relief, but is rarely a long-term solution to a complex problem. While taking some actions may make people feel better in the short term, globally competent students realize that the best course of action to a complex problem is one that sheds light on issues in order to promote change and improve the conditions of people, plant and animal species, and the environment for the health of the planet. 12. Action: Globally competent active citizens are aware of how power and justice play out in the actions they take. While students are taking action to advance their communities, they are listening closely to those most affected by whatever challenge they are aiming to help mitigate. Students are looking at themselves as actors, and considering their place in the process of taking action for sustained change. Globally competent students use a systems approach before taking action to ensure that unintended negative consequences are minimized. After taking action, students engage in an iterative process of reflection that prepares them to leverage their strengths as globally competent individuals to make sustained contributions to their local and global community over the course of their lifetime. How can we monitor progress toward global competence? 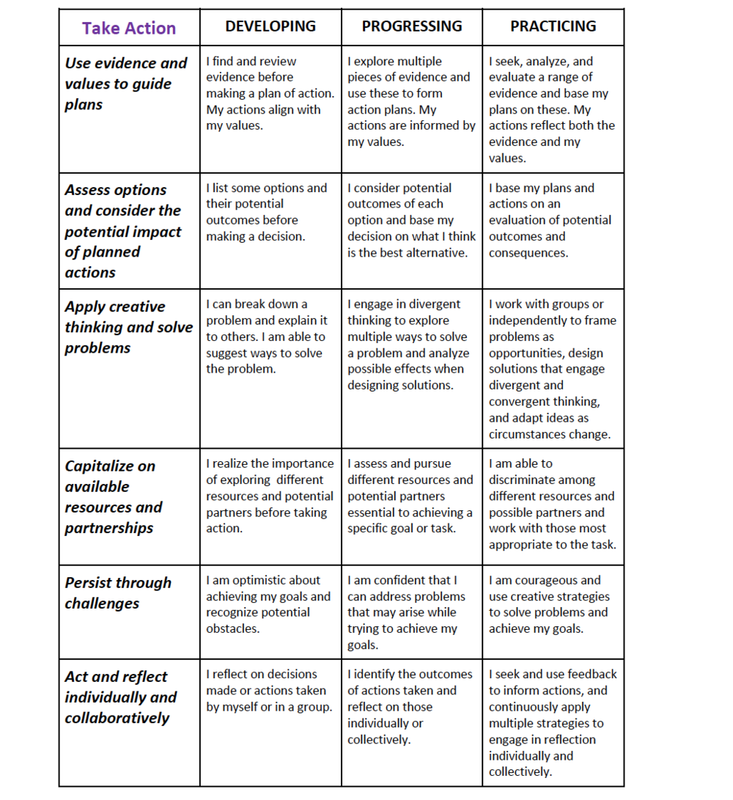 ASCD has developed a Globally Competent Learning Continuum (2017) for educators to use as a tool for reflection and growth. The California Global Education Network (2017) has developed benchmarks using the CGEP Global Competence Indicators for use with K-12 students. These benchmarks are intended to guide greater understanding of global competence among educators, parents, community partners, and students, and support the implementation of global education programs in K-12 classrooms, after-school programs, and informal education settings. We recognize the value of these indicators and benchmarks as tools to engage parents, guardians, and business/community partners in building global citizenship together with educators. However, we want to hear how you are using them in your work and how we can support you to develop global citizens in your classroom, school, and district. Please share with us your questions, comments, ideas, and suggestions here. As the work of CGEN and the California Subject Matter Projects (CSMP) continues, these indicators and benchmarks will be used in communications, forums, professional learning, and resource development for the benefit of K-12 global education in California. Stay connected to CGEN, CGEP, California World Language Project, and other CSMPs for forthcoming information and opportunities.